When it comes to investing in graphic arts machinery and equipment, our priority is ensuring you have enough knowledge to make the best business decisions. With our help, you can make sure you have all the necessary information and feel confident in buying the right equipment at the right price. Printer’s Parts & Equipment is proud of our long tradition in the printing industry. We are happy to share our knowledge with our clients so they can become more empowered in the process of buying and selling graphic arts printing machines and equipment. If you are looking to upgrade your finishing line, we have a large inventory of guillotines, die cutters, stitching and perfect binding lines and many other bindery solutions. Review our selection of current inventory including printing machines and equipment from Heidelberg, Mitsubishi, Ryobi, Komori, KBA, Man Roland, Shinohara, Sakurai, Polar, Muller Martini, Bobst and other leaders in the graphic arts industry. If you are looking to upgrade your CTP computer-to-plate imagesetter or platemaker system to increase productivity and minimize make-ready times, we can help you make the right choice for your needs. Select from a range of sizes, makes and models, including Kodak, Creo, Screen, Heidelberg, Fuji, Agfa, ECRM and more. 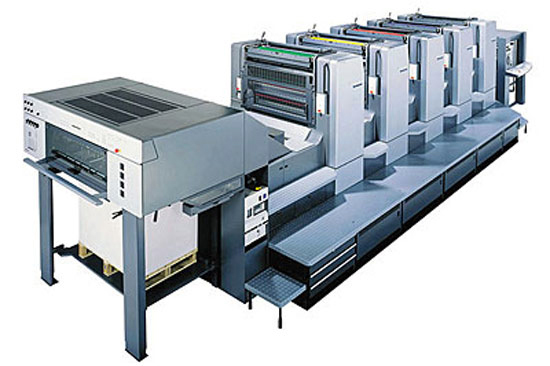 Below are some of the leading printing press brands we offer at Printer’s Parts & Equipment. Click on each to learn more about what makes them among the best in the world. Understand the benefits of selecting Heidelberg, the most recognized brand in the entire printing industry. Discover what Komori’s Japanese technology can do for you with minimal downtime and fast make-ready times. Learn why easy-to-maintain and service Mitsubishi printing presses are an excellent choice for paper and board printing. Find out how these durable and resilient Japanese Ryobi printing presses are optimal for short-run, small-format jobs. For aggressively priced German engineering, a KBA printing press ideally suited for those in the packaging industry. With a variety of large-format options, German-engineered Manroland printing presses offer fast changeover & make-ready times. Explore your printing equipment options. ©2019 Printer's Parts and Equipment. All Rights Reserved.